"I'm the best thing in this town," she arrogantly declared after cops busted her for being a drunk nuisance Friday, according to an insider. "She was bad-mouthing everyone who walked by her [in the police stationhouse]. She was saying 'I'm a star, you can't do this to me.'" Snooki unleashed a boozed-up, expletive-filled rant after being arrested for disorderly conduct, and attempted to use her new-found fame as a "get-out-of-jail-free" card. 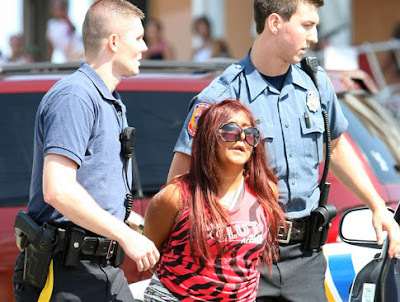 "You can't tell me what to do - I'm Snooki," she yelled at officers, according to witnesses. "Do you know who I am? I'm f------ Snooki. You can't do this to me. I'm f------ Snooki. You guys are going to be sorry for this. Release me!" Not surprisingly, her harsh language didn't do the trick. The pint-sized reality TV star was hauled away from the Jersey shore boardwalk in cuffs Friday as her oversized shades slid down her nose. A photo of her looking dishevelled with mascara running down her face while in custody also surfaced yesterday, as locals took stock of her unruly behavior and lashed out at the reality show cast. "My world's been turned upside down," says Chris Wilson, a charter boat captain in Venice, La. "Our life as fishing guides and marina owners — and everybody down here. We used to fish every day. Now we ride around and look for oil, or ride people around, you know. They say we're working, they say they're paying us, but nobody's got paid yet ... I guess it's coming." This quotation comes from photographer David Zimmerman's latest series, "Gulf Coast." A fine-art photographer based in New York and Taos, N.M., Zimmerman relocated to Louisiana just after BP's April oil spill and, for the past few months, has been using a large-format view camera to put faces to the oil spill. "For all the devastation I saw offshore," Zimmerman writes in his artist statement, "the worst of what I saw was onshore; in the faces and voices of the people who call this place home."